Mkuze Falls Game Lodge is situated in the Mkuze Falls Private Game Reserve, in the heart of South Africa's historic Zululand. The Mkuze Falls Private Game Reserve is neatly situated in the heart of historic Zululand in the South African province of KwaZulu-Natal. Mkuze Falls is one of only two Private Game Reserves in the region where you can view the Big Five - lion, leopard, buffalo, rhino, elephant - and for bird lovers', nearly 400 species of birds are resident. 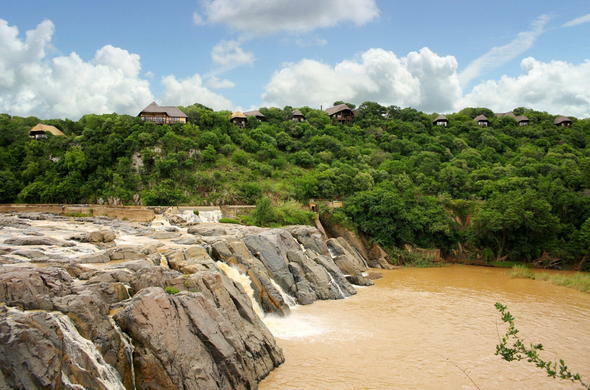 The Mkuze Falls Game Lodge is nestled along the northern bank of the Mkuze River, in the heart of Kwazulu Natal. Overlooking the Mkuze waterfall, the game lodge features a Safari Suite which is perfect for honeymooners and nine luxuriously appointed thatched chalets, accommodating 18 guests in utmost comfort and style.